Laundry is my life. Seriously. It is all I do. On any given day you can call me and ask what I'm doing, the answer will be laundry. I made it my goal to be completely caught up with my mountains of clothes by tomorrow. Yeppers, that's the plan. And I'm obviously done and that's why I'm blogging. Right! I wish that were the case. I have done lots. I did four loads of laundry this morning. But, it seems I'll never finish. Why the heck do we have so much laundry anyway? Does everyone wear 10 outfits a day? Do we need to become nudists? I think a lot of it is the fact that very little dirty laundry actually ends up in a hamper. They stash it under beds and such until I finally flip out and make them find it all. So, I will get caught up on laundry by this weekend. And I am planning a major shake up to this household's laundry system. I am not a maid! Stay tuned for further reports. Does anyone else have a Mount Dirty Clothes? 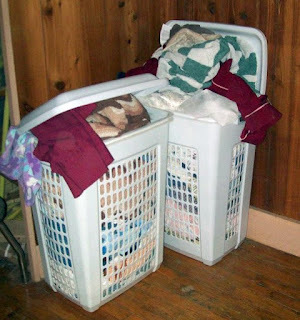 How do you deal with laundry in your home? I'd love to hear your ideas! I have NEVER caught up on my laundry, adn there is only me and my hubby. He changes clothes like a teenaged girl. I swear my laundry clones itself everytime I leave the room. How do I tackle the mountain? Well.....I would rather spread it out over the week, so I wash about 5 to 6 loads a day. And then I spend one day a week doing the rest of the work. But I have a large family with 6 kids, so you know the mountain never gets any smaller. Good luck tackling that mountain. I think we all can relate to this!!! The other day this is just what I was thinking......I am always doing laundry!! There are only 4 of us! I know people that have 4 plus kids and then the adults..can you imagine?!!!! It's Dixie, Shelby, Cookie and Annabelle! They're secretly trying on all your clothes while you're out or asleep! I used to have the same problem, so I went to good ole' Wal-Mart and bought these $5 pop up hampers for everyone's room (even the baby) and for the bathrooms for towels. They work great, no more missing clothes and no more on the floor. I do all the clothing laundry on Monday and all the towels and bedding on Thursday. This works great too. Hope this helps a little. you doknow that i too have a never ending pile cg showed up today w/more! i just hide it well! ok...i just spelled "meat" as in food rather then "meet" sorry. i just got my wisdom teeth out and I am on pain meds :O) a little loopy right now..lol!!! i hate laundry. HATE IT. I feel your pain.